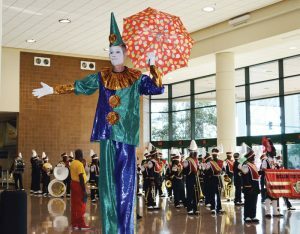 IFAI organized a parade led by the Helen Cox High School band to take Expo participants from the Ernest N. Morial Convention Center to the opening reception held at The National World War II Museum. IFAI wrapped up a successful expo in New Orleans — an event that offered a full schedule of education, demonstrations and meetings, as well as a range of networking opportunities. IFAI Expo 2017 was held recently at the Ernest N. Morial Convention Center, New Orleans. Show organizer, the Roseville, Minn.-based Industrial Fabrics Association International (IFAI), reported more than 4,500 visitors came to the event, and more than 380 exhibitors participated in the expo show floor. Attendance numbers didn’t quite reach 2016 figures, but it was a well-attended event and organizers reported the show was “a great success.” The expo began with a full day of Advanced Textiles and Specialty Fabrics conference programming followed by three days of exhibitors showcasing their products and services geared to people working in the specialty fabrics, advanced textiles, and shade and weather industries on the expo show floor. Highlights from the show floor included the new Hackathon Design Challenge, Mentor Meetings, Testing Demo Zone, and e-textiles and smart fabric programs. “Our keynote [speaker], Derreck Kayongo, was inspiring and brought the entire audience to their feet,” said Mary Hennessy, IFAI president and CEO. “I think my favorite part [of IFAI Expo 2017] was the Opening Reception at the World War II Museum. After following an authentic New Orleans parade to the party, we were entertained by Hangin’ By A Thread, a band made up of our own multitalented industry colleagues.” Hennessy recently announced her retirement effective June 2018, so this was her last expo at the helm of IFAI. As always, IFAI recognized high-achieving products and designs with the ShowStoppers awards, International Achievement Awards (IAA) — which recognizes design excellence and technical skill in specialty fabrics — the 2017 Industrial Fabrics Foundation (IFF) Innovation Award, and the 2017 Fabric Structures Student Design Challenge awarded by IFAI’s Fabric Structures Association. End Products — Rainier Industries for the Glacier Awning. Advanced Textiles — Coppins Sea Anchors Ltd. The 2017 IFF Innovation Award and $5,000 prize money was presented to UltraTech International Inc., Jacksonville, Fla., for its EverShield® C6 water-based fabric treatment. First place in the 2017 Student Design Challenge was presented to Ahmad Nouraldeen from Anhalt Hochschule for the Tenso Refugee Shelter. Fabien Burgeat from Clemence Saint-Maurice and Estelle Privy from Vallès School of Architecture ETSAV were awarded second place for their Beer Discovery Pavilions; and Ansh Vakil from the University of Southern California took third place for R(e)-Invigoration. IFAI streamlined the registration process and visitors were able to easily and quickly obtain badges this year after glitches in 2016 resulted in long lines at registration on the first day. Feedback from expo exhibitors was positive. “If you missed this one, you really missed a terrific event, but as they say in baseball, there’s always next year,” Hennessy said. The next IFAI Expo will take place October 15-18, 2018, in Dallas, and will be collocated with the Composites and Advanced Materials Expo (CAMX).